"Can you please tell me what to look for in a watch?" 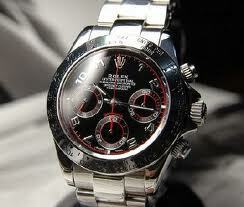 "I am considering investing in a nice watch. What should I look for?" "What is the best watch to wear when formally dressed?" If you are interested in spending a few-to-several thousand dollars on a watch, I suggest that you put little-to-no stock in what some writer of a blog has to say about it. I have several friends with very pricey watches and very fast cars - two devices that should facilitate a prompt arrival - yet they are unable to meet me anywhere close to the agreed upon time. For the most part, the watch hides under the cuff, and if you're in a social setting it's best not to check it in view of others ("I'm sorry, do you have someplace better to be? Is my anecdote about Margaret Thatcher boring you?"*). Without fully fleshing out the possibilities in a longer and far more tedious discussion, my advice is try harder to be on time, and not really worry about buying the "right" watch. *Yes. It is boring. After she quipped smugly, you had a well-phrased response. We've heard. At least a dozen times. But your wife told us that this was when [The Rt Hon. The Baroness] Thatcher [LG, OM, PC] was Education Secretary, and that you later apologized to her lead aid. A surprising number of emails come to me asking about shirt patterns. At many of the large accounting/consulting firms, only white dress shirts were permitted (this has largely been relaxed since 2000 or so), making pattern and color nearly criminal... a restriction that is more offensive than the assumption of offense of wearing pattern. Imagine a large multi-floored office, staffed by private citizens, all told that only white dress shirts with barrel cuffs will be permitted as a condition of working there. The advice they provide-for-fee better have an accuracy rate in the 80% range to make that nonsense tolerable. Readers often ask what pattern is the best. 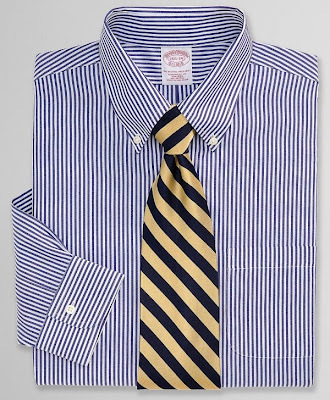 In America, the most conservative pattern is our beloved Bengal stripe in navy or lighter blue. This is a staple pattern in which all men should own at least one shirt. It can be worn with nearly anything, and besides white, it is the most versatile and lasting shirt pattern that we have at our disposal. While there are slight variations in blues, widths, etc., it is one of our finest. 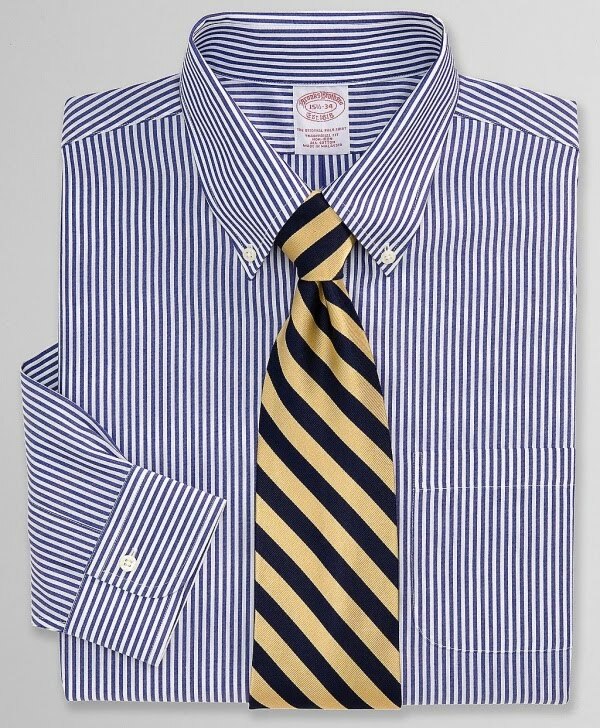 Jeans, khakis, shorts, flannels, suits, corduroys, sweaters, and with nearly any tie, the navy Bengal stripe is universal to the point of being almost overlooked by the eye. It is great as a soft button-down collar, a casual faded oxford, a cut-away collared french-cuff, a barrel-cuffed pointed collar, and even as a white collar/white cuff version, the universal appeal of this shirt is obvious. While it is traditionally not uniquely American by any means, it has become a staple of Americanism, generally accepted in nearly every application. 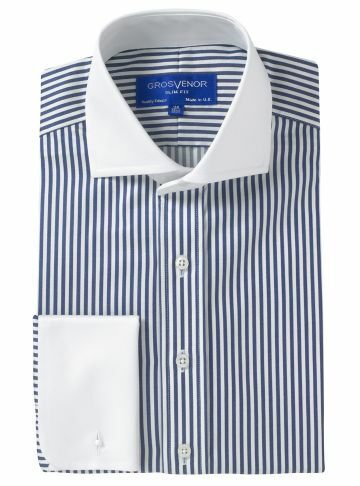 Unbeatable with a navy blazer, conservative with a suit (even a 3-piece), great under a rugby shirt or over a solid polo shirt, and ubiquitous with white pants and Sperry Top-Siders in summer, this shirt can withstand any pattern of tie, bow tie, ascot, and in any color. If there is a truly American shirt pattern, this is sure to be it. Perhaps there are others that carry more historical importance, but this pattern, in ANY cut, is (beyond plain white) the single most versatile yardage of fabric at a man's disposal when assembling a wardrobe. 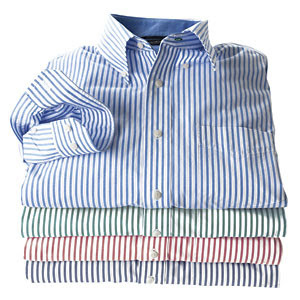 If one had to have two shirts only, they would be a single white one and a single navy Bengal stripe. 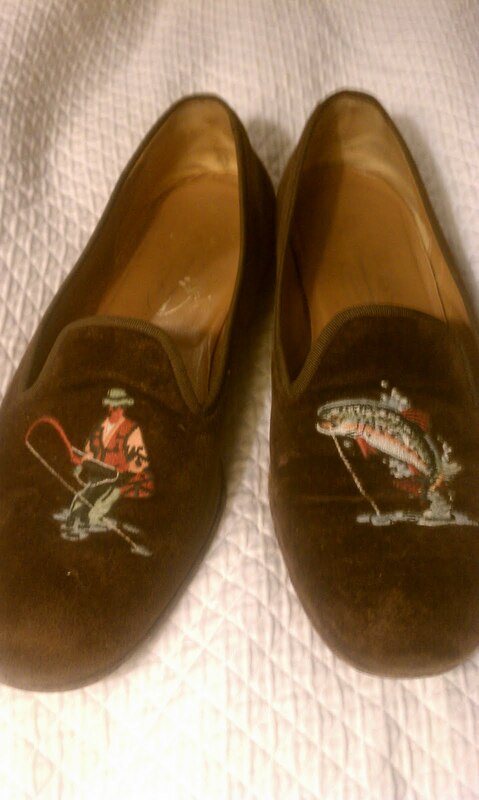 When I see them on sale at LL Bean in wrinkle-free, I get them. 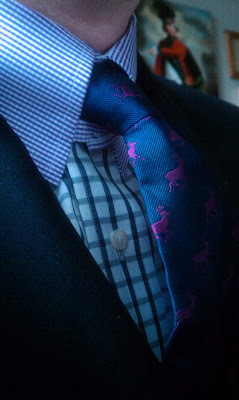 When I saw them at TM Lewin (slim-fit St. James Collar) online for $30 each, I ordered several. When they get too worn out, they become short-sleeved beach shirts, painting smocks, handkerchiefs, etc. And when I travel for business or pleasure, they are first into the suitcase. 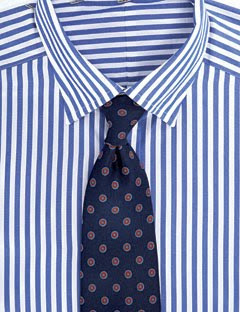 Even the tattersall and pinstripe shirts are out-paced by the Bengal stripe, restricted by no season, and welcome with more assemblies than any other pattern. If Americans can lay claim to a single shirt, this may well be ours. 1. Is it appropriate or even desirable for men to wear fragrance? 2. If it is appropriate, which specific fragrances are acceptable, and what is the best method of application? 3. Please address the relative merits of cologne vs. aftershave. For millennia, we men have offended the noses of the more pleasantly fragranced. Either wrapped in stinking fur hides in a flame-lit cave or standing watch on a square-rigged floating disease incubator wearing a festering neck-cloth, we have historically not smelled good. Fragrances were always a masking agent for men, a way to quickly clean up, and to attempt to make closeness with another human tolerable, despite the putridity we effortlessly emit. Fragrance in our past was critical, possibly the main factor allowing humans to tolerate one another long enough to allow reproductive mechanisms to complete themselves. As far as it being desirable and appropriate, the answer is in the nose of the beholder. Some fragrances have an innately pleasant smell, and others recall memories (in any direction) of their associations with that smell. Olfactory memory triggers are frighteningly instantaneous and accurate, and you may be flashed back to an 8th grade slow dance when you catch a whiff of Polo on the subway. Men also risk having the association be unfavorable for the recipient, as we all have experienced at one time or another. As I left for college, Father told me not to pick out my own cologne, unless I wanted to pick up other men... advice that translates beautifully into so many other areas. Great Uncle once told me that a man's fragrance should only be detected by a lady when sharing a dance or a secret. Damn fine advice. This means applying it with a Q-Tip or the tip of a finger somewhere in the mandible/ear lobe/neck area, in the tiniest possible amount. Again, the tiniest possible amount. As for which particular scent to choose, I believe that this is an age-old dilemma, the solution for which is somewhere in the trial-and-error laboratory of one's dressing area/night out. Men also should fully confront the possibility that NO scent may be their best option, and these decisions should be approached with brutal honesty between woo-er (scent wearer) and woo-ees. The third part of your question (cologne vs. aftershave) is also important. Aftershave is a cooling/antiseptic/soothing liquid with fragrance ranging from subtle to over-powering, applied to a freshly-scraped face. Like shining one's shoes, sometimes a nice aftershave can give you a lift in the morning, and I find them particularly nice in the summer. I only occasionally use aftershave though, and when I do, it's Clubman. The scent is pleasant and not all-consuming, and unlike cologne, [aftershave in general] looses its potency relatively quickly. Aftershave is dashed into the palm in the same quantity as bitters into a Manhattan -one or two will do the trick- rubbed together, and clapped onto the newly de-whiskered face. If you prefer to go Old school, witch hazel also makes a nice aftershave, and it will straighten up your spine when it goes on for the first time. A small bottle from the drug store will cost under $3. We have all experienced the nauseating and imposing sensation of someone wearing far too much fragrance, and for those of us with acute senses of smell, it can be very uncomfortable. My final advice is DO NOT COMBINE. If you choose to wear cologne (I never do), do not use aftershave, and only use a scentless deodorant. For those who recall the post about restoring worn out shirts, I took several more shirts to the Wellesley shirt maker (Custom Clothiers) to replace the worn out collars and cuffs. Harry was happy to provide replacement therapy, and I was quickly talked into transitioning the shirts from conservative (business-acceptable) to a more social configuration. 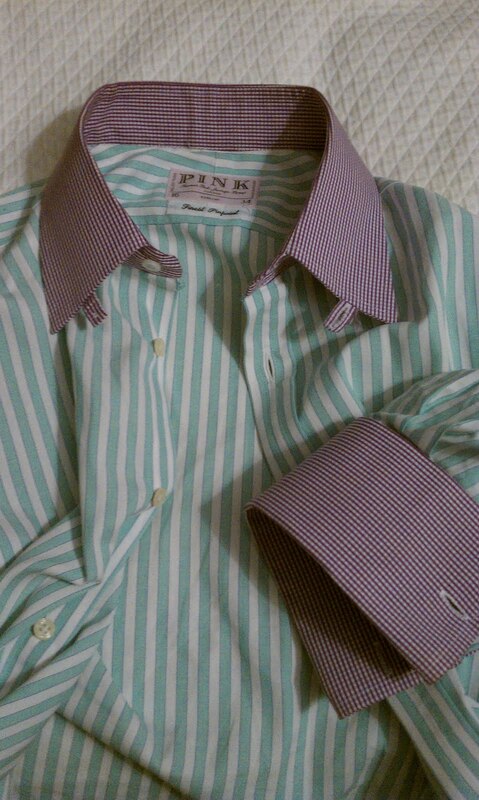 The first was a nice Thomas Pink number I've had for a LONG time. I chose "lilac gingham" (as TM Lewin says) and with a tab collar. French cuffs replaced the barrel cuffs, and the result was interesting. The next was a small butcher-check in black and white from Brooks Brothers that I bought on clearance about 10 years ago. It got the exact same treatment, again switching barrels for thick French cuffs. 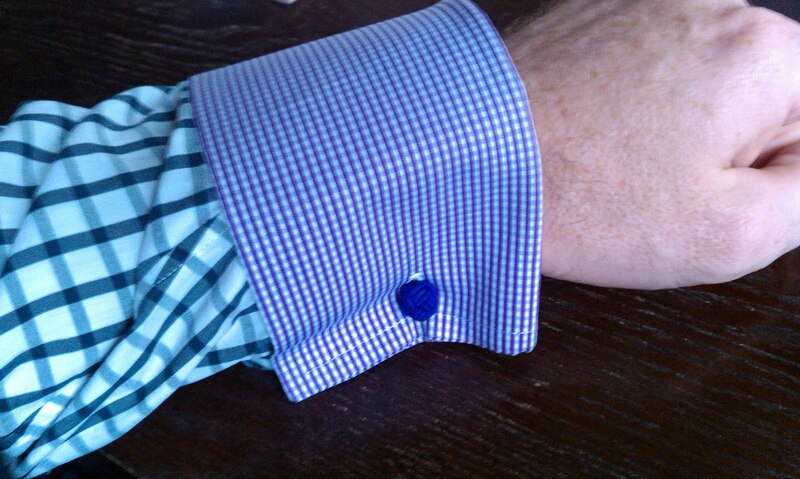 Since I never wear these shirts without a jacket, I could allow a thicker and sturdier cuff. The tabs close nicely with tiny buttons, and the contrast is fascinating to some and offensive to others. Success. Like all good tab collars, they lift the tie just so, creating an illusion that the collar stands higher and more formally than it actually does. Have a shirt ruined with ink or rips in the body? 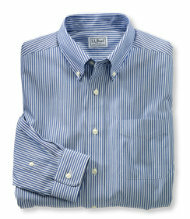 If the collars and cuffs are alright, consider saving them and scrapping the rest of the shirt. There is a good chance that your local seamster/seamstress can attach them elsewhere, or if you are good with very small stitching, it seems a great way to cobble together a great salvage job. If you try this, please feel free to send in your photos, and I will post them in a future feature. Winter brings snow. Snow brings boots. Boots bring messes into hosting houses. Leave your boots and thick winternalia at the door, in the mudroom, by the coat rack, or in the foyer. Slip into your velvet slippers or shined smooth-sole mocs, and enjoy the festivities. An evening suit, black-tie, sweater/jeans, or jacket/tie combination will always be enhanced by Albert house shoe. I picked up a pair of Stubbs & Wootton in brown with a flyfishing scene that, as Dearest Grandfather pointed out, when placed side-by-side, clearly depicts a rainbow trout who has snagged the fly line under a submerged branch. Just my luck. 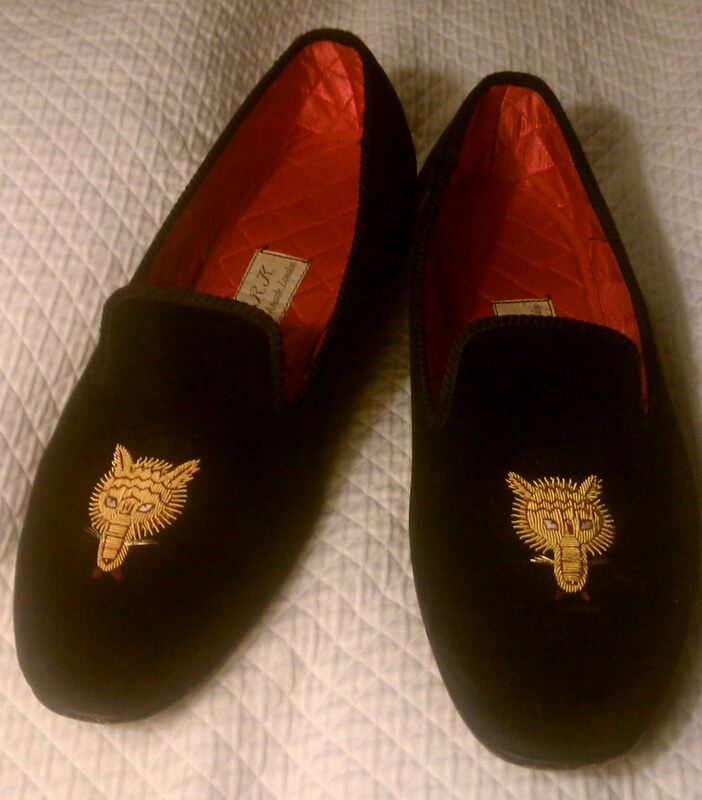 For black-tie and evenings, the Berk fox heads are great, and their quilted red lining make them soft and warm. 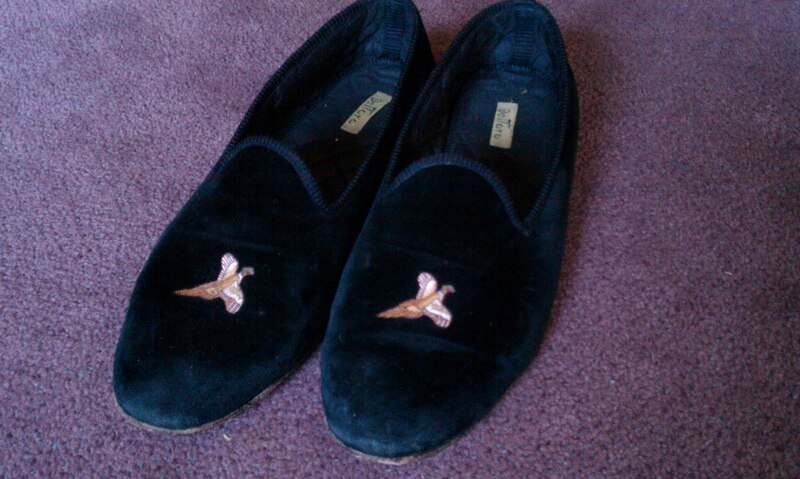 A few years ago I purchased some of Del Toro's embroidered pheasant slippers, and they have held up very well. Del Toro has relocated their production to Spain, and the already fine quality has improved even more, though they are still of the least expensive on the market. I also found a pair of very inexpensive (dark red) velvet slippers online, that are much thinner, but still do the trick. Velvet slippers always make great gifts, and while they can be pricey ($125 and up), they will last and be loved... landmark or milestone birthdays, anniversaries, etc. 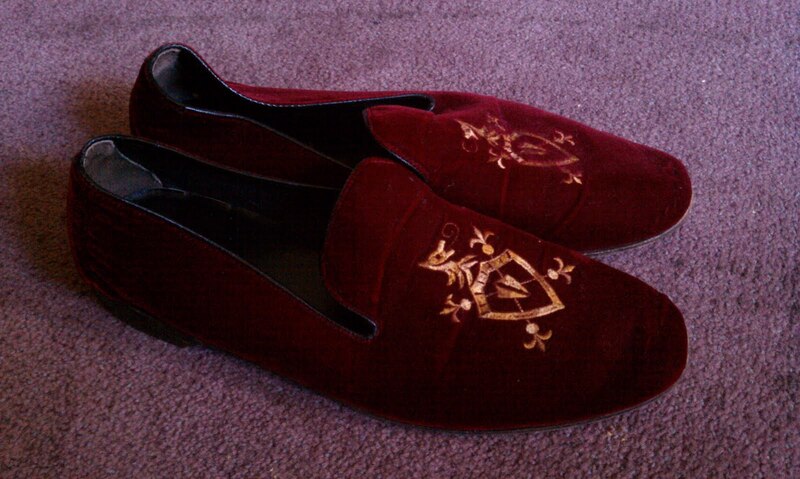 On top of it all, they make good slippers too for pajamas and robe. Be warned about their smooth leather soles, though. When combined with carpeted stairs and an abundance of brandy, phrases like "take time to slow down in life" take on new meaning. Men in the Northeast tend to do one of two things concerning their scalps and ears on very cold winter days: nothing or barely something... similar to what they do when it rains. Further north (Maine to the Dakotas and upward), men have a bit more sense concerning the cold and their heads. I have a theory that each person has "their temperature" on either end of the thermometer. These are the points below or above which all care about style and presentation abruptly end. For me, about -10 Fahrenheit trots out the "snow ninja/nuclear refugee" look, while my wife's thermostat engages at anything below 40. All of this aside, the question remains: How does a man dress in harsh winter, concerning his head? It seems that in the US, we are very bad at wearing hats (this generation), so one should first look to the cold weather hats sanctioned by uniforms. 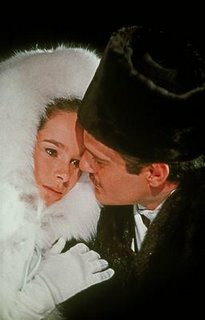 The US Coast Guard Academy, the US Post Office, Police Departments, etc., all prefer the aviator-style hat with fur or wool in/suede or leather side out. Obviously, a relatively plain dark colored watch cap is always safe in cold, but if you have to be seen outside in these low temperatures (parades, dedication ceremonies, caroling, etc.) and you are required to dress, a better hat is called for. Fur. If fur is not appealing, one can go synthetic if you dare, or try out lambs wool in one of the shapes ranging from envelope to stove-pipe. 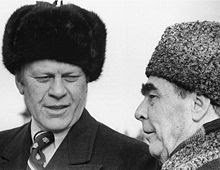 The Russian "ushanka" (ear hat) is also a prized winter option, and I'm seeing more of them around various financial districts. Be sure that you remove all medals, badges, insignia, etc., or you'll look like a fool and will be the recipient of Red-baiting from the old-timers. 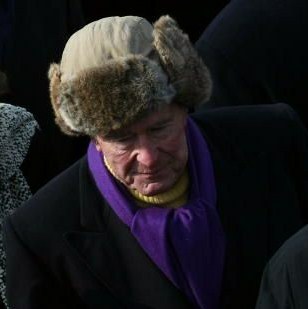 President George H. W. Bush wore one during the painfully cold inauguration of President Obama, rocking a purple scarf and wool turtleneck... no tie. Here, President Ford still looks patriotic wearing his. 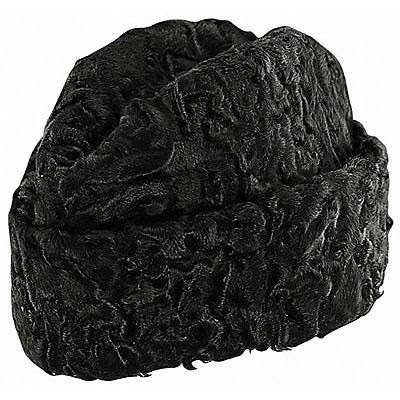 The ear-flaps on the ushanka do not need to be deployed to be warm. 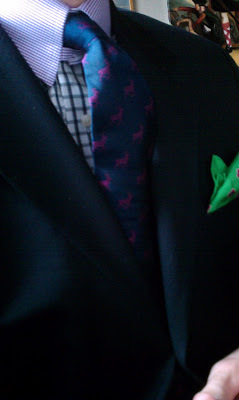 If they fasten atop, simply loosen the ties and lower the fold to cover half of your ears, and it is remarkably warm. If it gets too cold, and you drop the flaps fully, you will be warm beyond belief, but won't hear a thing. What you don't see are the fleece ear-flaps/half-band that fold down for insane warmth. Drop the back brim down (if your collar is high) and it's fantastic in hard rain. It is warmly lined, and I cut off the tag you see in the picture. $40 or so, but with a lifetime warranty as usual per LL Bean. They also offer a gray wool one (dressier?) for under $30. I'm not sure why men have such strained and dysfunctional relationships with hats, either adopting a single one as their "trademark", wearing them indoors, at a table, reversed, or just not wearing one when they are needed (sun, snow, etc.). I don't want this to sound like a retro-nostalgic plea for all men to start wearing hats again at all times, but the abstinence and hard-line approach to hat policy is childish. 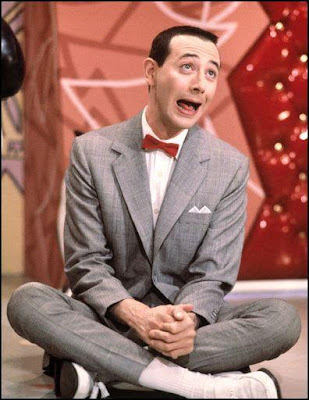 This posting is to decry the current trend of tight high-water pants. It seems to be the approach for 20-30 year-olds being dressed by someone else for the purpose of magazine or catalog photography, converting otherwise very nice materials and patterns into a near-ruined set of clothing. If you can see the sock beyond the occasional flash, the cuff or pant leg is far too short. 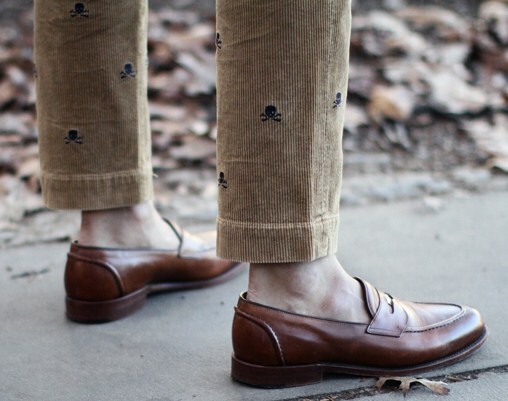 A high-water pant leg can be acceptable, but there should be room throughout the pant, not tight AND short. Socklessness with dress lace-ups is a bad move (Topsiders are one of the several obvious exceptions), and summer/early autumn (VERY early autumn) are the times for it. What is barely passable in a photograph can be disastrous in the flesh/cloth. 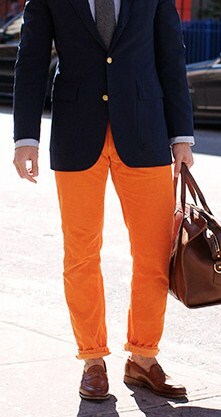 Tight pants on men should be restricted to wet-suits and other athletic applications. Paul Rubens and other similar-schticked dressers could not have imagined that their parody would become emulated in earnest by those applying their brand of rough-tuning to areas generally off-limits as dictated by the human eye. The faux-growth spurt look is odd, and is thankfully temporary. If the shortened look hits the wrists, I'll lose all hope. Style and fashion are two different things. Fashion takes style and tunes it, alters it, and repackages it into something that may or may not nod to the original. 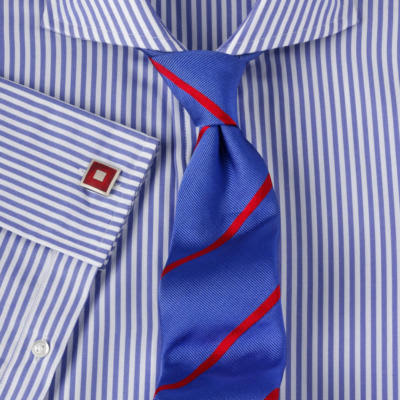 When "preppy" and "WASP[y]"* became the launching point for a particular fashion trend, it was inevitable that the mark was missed on many points. Observers emulated the color, patterns, materials, and combinations of the look, wrote examinations of the manners and attitudes, and analyzed and documented the customs. While many were VERY observant in their writings, most failed to note that which was NOT done. 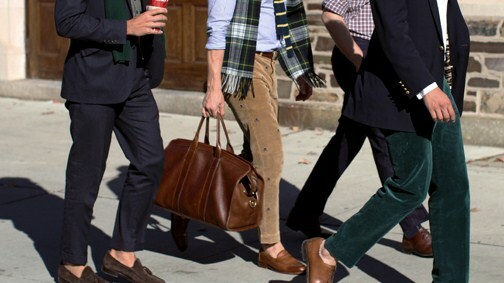 These young men are shocked and indignant when they are told that while their tweed jacket and club tie are nice, their jeans and sockless ankles will not allow them to remain at the Club (though they are generally allowed to finish their drink, if their host got them that far). *Stop trotting out these terms so liberally.